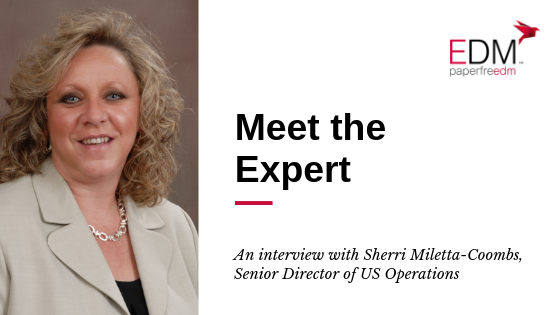 In our new 'Meet the Expert' series, Sherri explains why organizations choose to outsource their Print services to EDM, and describes the impact of the technological advancements that have enabled EDM’s operation to evolve into a slick and highly efficiently operation. Sherri Miletta-Coombs is the Senior Director of US Operations for the EDM Group. Based in Millville, New Jersey, Sherri oversees the US outbound print facility, processing transactional print services for organizations in highly regulated and audited industries. Q: Sherri, how long have you worked for EDM? Sherri: I’ve worked for EDM Group for the past 7 years. Prior to this, I worked for Prudential for 23 years. Q: What's your core area of expertise in relation to EDM Group's offering? Sherri: EDM helps clients in highly regulated transactional markets such as insurance, healthcare, finance, and government sectors. These customers are large multi-national organizations that count on EDM’s print services for their non-core activities. "My experience includes working in highly regulated industries, and so I am fully understanding of the level of service we need to provide to our customers to ensure they remain compliant with regulations across business processes." Q: In your opinion, why do customers choose EDM to outsource their transactional print services? 1. To reduce their costs in labour, print, postage and overhead. 2. To attain higher efficiencies with shortened SLAs and higher productivity. 3. To utilize EDM’s advanced technology platform and service. Q: Let's talk about trends. What changes have you seen in outbound Print in the last few years? Sherri: Over the past two years EDM has upgraded its print platform from traditional black and white toner equipment to high speed, cut-sheet and continuous high speed inkjet print. Enhancing the speed and quality of all projects we process. With the technological advancements, all information being processed is tracked automatically in our document factory environment, with end to end reconciliation. "Basically, what this means to our print customer’s is that they have access to a print portal hosted on our secure cloud platform, EDM online. In here, they have visibility of all of their active print jobs and can access status updates at package level detail." 2. Our client’s customer services departments have access to status of jobs at addressee level which ultimately means they can update their customers with real time information. Overall, this portal provides complete transparency, enhancing our client’s experience and their customer’s experience, whilst remaining compliant.”. Q: What are EDM Group's capabilities? Sherri: EDM utilizes the best in class technology operating in an automated document factory with a file-based end to end reconciliation. Our print services are performed on high speed, full color, continuous and cut-sheet Inkjet equipment with MICR capabilities. "At full capacity, EDM can process up to 1.2 billion images and 250 million packages annually. Being part of the National Postal Policy Council, we are one of the US's largest 32 first-class mailers and pass those savings on to our clients." Q: Finally, in your experience, why do clients say they chose EDM? Sherri: We get a lot of positive feedback on our integrated client portal, as it allows our customers complete vision into all aspects of their production services. In short, this makes EDM more agile, flexible and provides excellent customer service to ensure total client satisfaction every time. 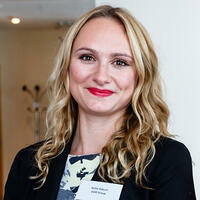 Kellie is the Group Digital Marketing Manager at EDM Group.